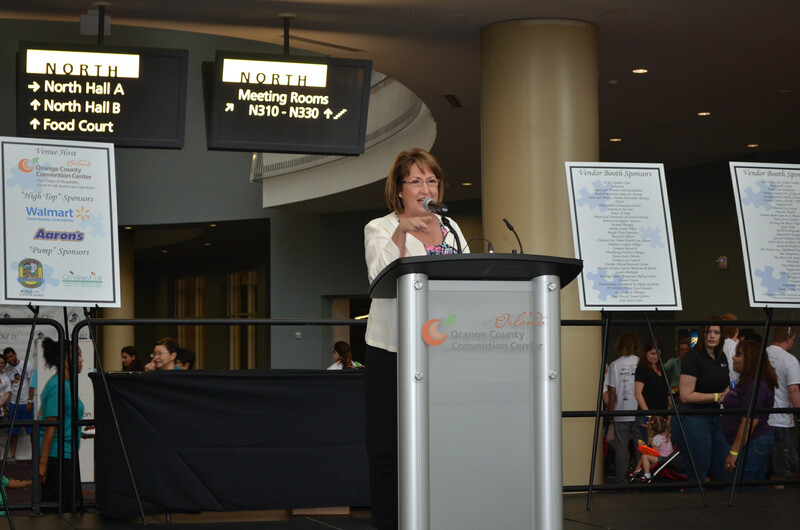 Orange County Mayor Teresa Jacobs recently attended the Autism Society of Greater Orlando’s (ASGO) 9th Annual Autism Walk and Family Fun Day at the Orange County Convention Center. Mayor Jacobs welcomed participants and their families with the keynote speech and provided a proclamation naming May 3, 2014 as Autism Walk Day in Orange County. District 4 Commissioner Jennifer Thompson spoke at the event and provided remarks on her ongoing inclusion projects in the community, including Orange County’s first inclusive playground as part of the new Young Pine Park in East Orlando. The playground will break ground on June 4 at 10 a.m. and allows all children and families to enjoy park amenities. As the third most prevalent development disability in the United States, autism affects hundreds of Central Florida families every year. According to ASGO, approximately 10,000 individuals living in the Orlando area have been diagnosed with autism. ASGO and other organizations are dedicated to providing a network of opportunities for these individuals. ASGO was founded in 1996 by a group of parent volunteers to better assist families of children and adults with autism in Central Florida. The annual 5K walk assists in raising funds for local families and increasing autism awareness. Mayor Jacobs kicked-off the 5K walk at the convention center with a countdown and led the group’s walk around the concourse. Other highlights included a raffle, silent auction, local vendors, kid’s activities and special treats for parents to enjoy. A record-breaking $73,000 was raised from the event. The support of Mayor Jacobs and Orange County’s Board of County Commissioner’s allows ASGO to host this event, with only seven percent of the funds raised going towards costs and 93 percent of the funds going directly to support our local families and autism community. A collection of photos from the event is available for media use and can be found on Flickr.